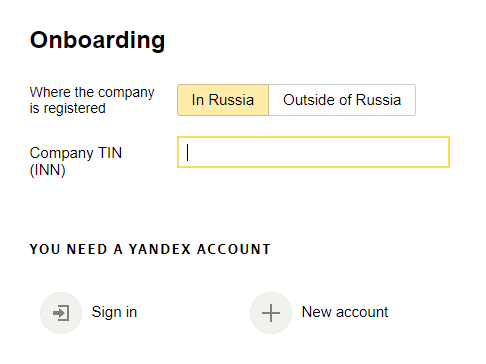 To sign up with Yandex.Checkout, you need to provide your company's INN (TIN) and start a Yandex account. 1. Onboarding starts on the Yandex.Checkout starting page. 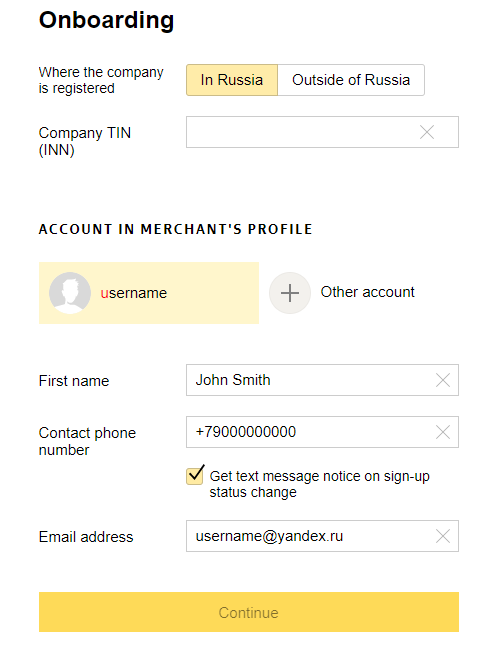 If you are already signed in some of Yandex's services, you will see your account right away. If you are not signed in, log in or start a new account. 2. Select where your company is incorporated (within Russia, or somewhere else). 3. If your company is Russian, specify its INN, if not, specify its country of incorporation. If you specify an INN that does not exist, you will not be able to change it later: you will have to create a new account. 4. Specify your Yandex account. The account specified upon signing up will become the primary account of your Merchant Profile. Its owner will be able to manage user roles and perform all operations. That's why we recommend you provide account of the company's CEO or create a new one specially for Yandex.Checkout. You can add special accounts for technical and financial experts to Yandex.Checkout later. 5. After that, you will see fields containing your contact details (we upload them from the account you selected). You can adjust everything: name, phone number, and email address are for cooperation with us, for our manager to be able to inquire details from you or tell you more about the onboarding process. if your company is registered in Russia, you can fill out the questionnaire about it and fill in your technical settings (both under your Merchant Profile). if your company is registered in other country than Russia, the set of required documents differs, and you need to send us the technical questionnaire via email. If you accept payments via Yandex.Checkout without a Merchant Profile, fill out all fields and wait for several minutes. We will recognize you by your INN and start a Merchant Profile for you. Initially you will see a page with a contract on work with the Merchant Profile. Download, print out, sign, and seal this contract. That done, scan and upload it on the same page. Our manager will check the contract and activate your Merchant Account for you.